It seems to me that in Australia, one of the staple Easter treats, are hot cross buns. In my family, it’s Bacalao a la Vizcaina. Every Easter, particularly, on Good Friday, this is the one dish, we all looked forward to having. Growing up, the idea was that on this particular Friday, we were required to fast the whole day and the one main meal we’d have, we’d have to abstain from meat. 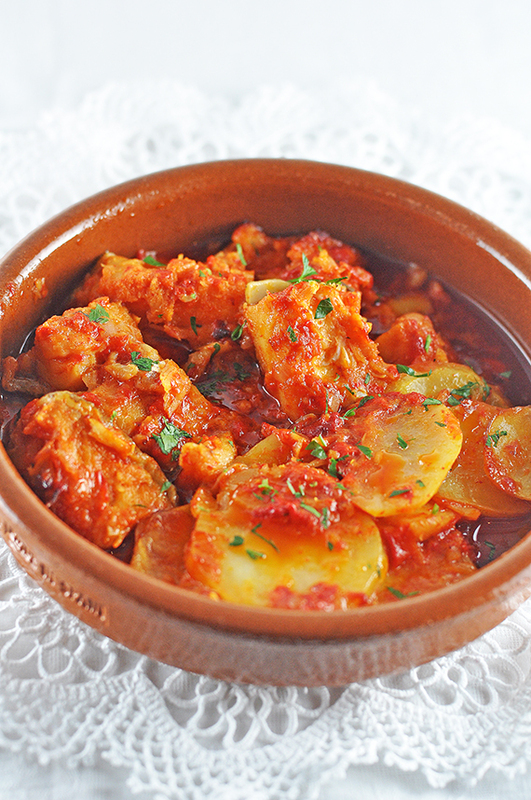 Bacalao, being the first meal we’d have for that day, was something we eagerly anticipated. In my younger years, I always associated Lent and Holy Week as a season of sacrifice. Which is why we had to fast and abstain from meat on Fridays, say extra prayers and go to confession. I always had this notion that part of the sacrifice was having the Bacalao dish. Not because it wasn’t any good. In fact, I thought, it was so delicious, that the “grown-ups” (as we used to call the… uhmm… “grown ups” in the family) decided to serve it but only in very small quantities to torment us. Can you imagine, fasting the whole day and only having one small serving of this dish along with a slice of tortilla espanola? It was pure torture! Now I think the only reason we had so little of it was because Bacalao was not that easy to come by in the Philippines – at least then. Luckily, Sydney has a few stores that stock up on salt cod and last Friday we all managed to have generous portions of this dish. Honestly, it was so enjoyable, I almost felt sinful for being able to eat so much! If you’ve never tried cooking bacalao or salt cod before, I hope this is the first dish you try it with. Believe me, you will be hooked. The salt cod blends exceptionally well with the roasted red peppers. 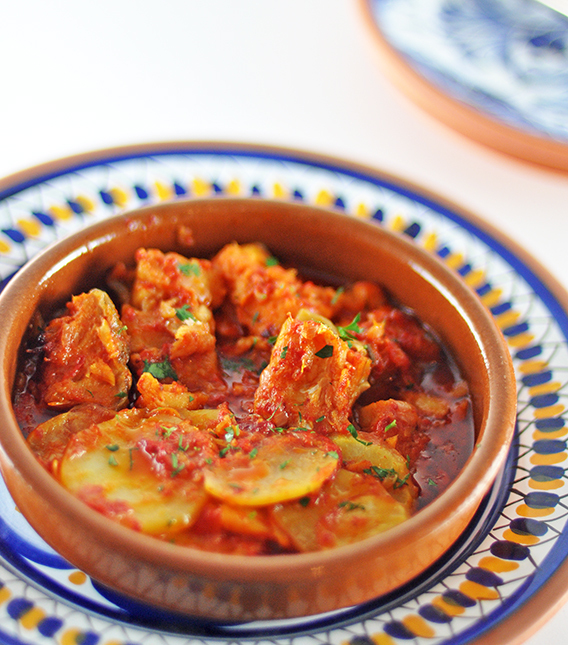 We usually serve it with potato omelette (tortilla espanola) or some buttered rice. I thought there were re-runs on TV. It turns out, she was cooking the bacalao. Cover the cod with cold water and soak for 2 days, changing the water at least 5 times. Over a direct flame, char the red peppers and then place them in a bowl and cover with cling film. This will make it easier to peel the peppers. After a few minutes, when the peppers are cool enough to handle, peel and deseed them. Next, cut the peppers into strips and set aside. Drain the cod, chop the cod into chunks and then dust with a little bit of flour and fry. Set aside when done. Heat the oil in a skillet and saute the onion, garlic and parsley until the onion is wilted. Using a food processor or blender, pass the onion mixture along with the peppers and blend until smooth. Add 1 1/2 cups water to the pepper mixture. Return this to the skillet with a bay leaf and salt and pepper to taste. Arrange the cod on top of the pepper mixture. Cover and cook over a low heat for 20 minutes. Cover and continue cooking over a low flame for about 20 minutes. Arrange the sliced potatoes around the cod and bake in a pre-heated over (160 c fan forced) until the potatoes are cooked, around 20 minutes. *Note: If the cod starts to dry, add some water to the pepper mixture. ** If you are in Sydney, you can get Bacalao in Spanish or Italian Delis. Otherwise, try your fishmonger. I managed to find some as well at the Fish Markets. This is indeed a staple easter treat. I think this traces all the way back to our spanish ancestry. Bacalao or Salted Cod Fish is a staple fish in spanish cuisine, cooked in tomatoes usually eaten during Lent, due to Roman Catholics fasting from meat, this is considered a delicacy in the Philippines because Cod is not indigenous to the Philippines, thus the need for salting so it’ll stay edible during the entire trip from Spain till Philippines. What a beautiful-looking dish: I can’t wait to try it next time we have salt cod. Thanks! True it was difficult to find n very expensive…. 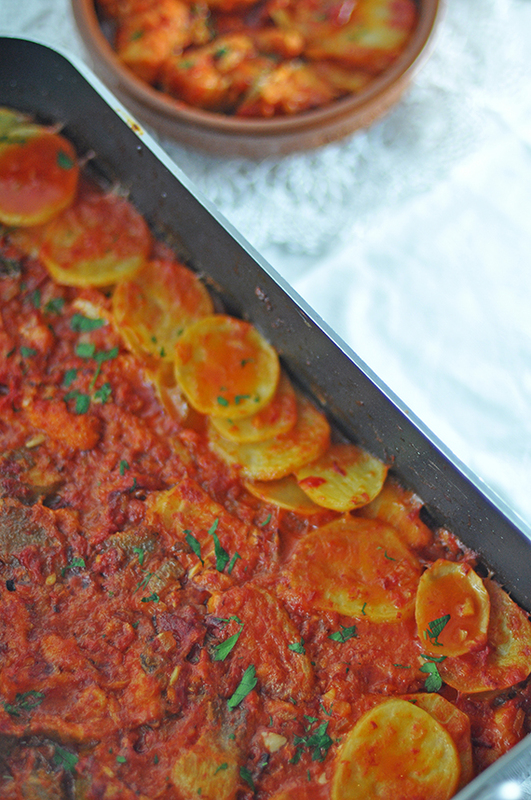 We, the older ones thought the kids like Trissa did not appreciate such a dish…. But it seems we were wrong. Now that she s an excellent cook she can have all she wants of it. One thing I noticed, the bacalao here at the fish matket is so good, big chunky pieces when what we get back home were tiny bits if fish…so that also made the kids think they were to eat only the bits n pieces of the bacalao. Lol, I love that you call her the Blog Monster…so cute! I’ve never cooked or even tried salt cod, but you make it sound like the best thing on earth. Quick, someone tell me where to buy it in Washington, DC! 8). Hope to try this soon! What stunning pics and what drool worthy food! I am so very pleased to have found your blog and will be back for more. This seems to be a truly great dish! I love red pepper and this kind of flavours. What a great feast! Nice cod dish – we need to try it! Oh yum, Trissa! I was introduced to bacalao in Montreal and loved it, but haven’t had any since coming back to Perth. I’m setting myself a mission to find it here now, hopefully it won’t be an impossible task. Great to have your Blog Monster back so that you can enjoy more yummy foods. Haven’t tried cooking salt cod before, but this dish look so tempting. Really want to try. I saw so much of this salted fish in Spain and Portugal. I wasn’t in a position to buy and cook it but now I know you can buy it here (at least in Sydney) I will get some. If you felt guilty eating so much of that, I wonder how guilty people felt when giving out so little of the good stuff in such a torturous fashion. Oh! I love salty cod fish, we used to use a lot back in Brazil, we call bacalhau…not much different 🙂 Love the way you prepare it…yummie! I’ve never had salt cod, let alone bacalao! I’d really love to try it. And the potato omelet sounds pretty good all by itself! Hope you had a lovely Easter, Trissa! Salt cod is a favorite in Greece. Unfortunately it’s so difficult to find in the Netherlands. I’m so used to eating it and I so miss it here. Your preparation of it looks incredible. The colour looks absolutely gorgeous. I usually just fried the salted cod and eat with plain congee but this looks so good I would love to try if I can get salted cod again. Thanks for sharing. Hope you had a great Easter, Trissa. Salt Cod? Never tried before but looks very delicious! We tried this last Good Friday – it was superb! Everyone loved it! Thanks BM and T.
I love bacalao…the Greek way involves frying it and serving it with a garlic maxh and wilted greens! Love this Trissa…”sinful” and good for you at the same time!!! This is seriously good and tasty Trissa, just by looking at it. I hope to taste this one day cooked by your mom or you. This reminded me of the Portugese dish I tried sometime back! Not a big fan of salt cod though. gosh. this brings back memories. When I was in university, my best friend, who is Portuguese, would invite me for homemade dinners at her mom’s house and I discovered the wonders of salt cod. Your dish reminds me of the bacalao I had at her home. So yummy! Growing up in an Italian family, bacala ( as we call it ) was cooked often in winter in a similar style but with tomatoes. I have to say I was never a fan but yours looks delicious. I almost tempted to try again… almost! I should remember this next Easter. Never cooked salt cod, this looks excellent! Great recipe . By far one of the most under appreciated, underused foods out there. Brandade is a favorite. My first kitchen job included making 25 lbs of brandade every 3 days. At first I couldn’t get over the “wet dog” smell. Now I can’t get enough of it. Thanks for attempting to make this somewhat unpalatable foodstuff a little more mainstream. Oh wow, the sauce looks incredible! Cod is my favorite fish. So I’m definitely bookmarking this. Thank you. Great color on the bacalao! Happy Easter! Oh, that looks so good! I would LOVE to prepare it – and I even know where to get salt cod – but man is it unbelievably expensive! yay glad to see blog monster back in action, and with such a regal looking dish no less =) always fun to see her cooking! MIster tried cooking this once but I think we didn’t soak the cod long enough. Will try it again since I know where to find the perfect recipe. I like Bacalao. I went to school with a girl whos mum used to serve Bacalao to us after school. She would boil it in milk and put all sorts of stuff with it. This dish certainly looks tasty Trissa. The Blog Monster is so cute. She calls herself the MasterChef. EHEHEHEHe. Not sure where exactly in Germany I can find some good quality salted cod…sighs…the dish looks so so tempting. Ooo haha… that comment of “come and watch the master chef” is just hilarious… :)) I can almost see your face when thinking it’s reruns of the tv series… lol… Having said that it does look like an amazingly tasty dish! Thankyou for another great recipe blog monster (and Trissa of course). I have often seen salt cod at the deli and didn’t know what to do with it. I am definitely bookmarking this one to cook some day. This looks so warm and tasty. Sounds like a fantastic dish for this weather.